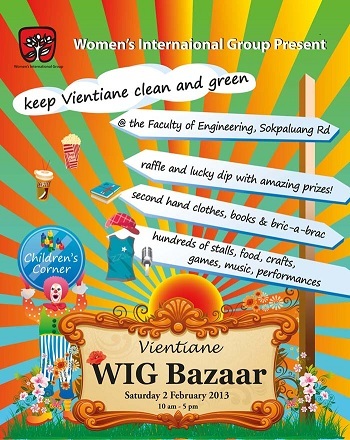 The WIG Bazaar is set for February 2 2013 at the Faculty of Engineering on Sokpaluang Rd. Though typically held in November they had decided that because there were so many other things going on in Vientiane at that time that it would be better to reschedule. The Bazaar has attracted 1000s of visitors each year. It continues to get better each year. There are a variety of performances, activities and people selling stuff. It's definitely aimed towards kids but there's usually something for all ages. Personally, my main thing is to go browse the stalls and tables to see what people are selling. You sometimes find odd items or really interesting things at good discounts. I remember finding some well priced books one year. Some of the stuff is new and some of it second hand but good condition. The variety of things seems to change from year to year. It's definitely fun and it's all for charity too! So be sure to check it out.